Now that Thanksgiving 2012 is in the record books, your LakeCountyEye is facing a long, protracted holiday weekend with nothing to do. Which makes for the perfect time to crack open a mystery or two -- your LakeCountyEye's favorite holiday diversion. ... regarding Lake County Sheriff Mark Curran's mysterious flip-flopping, like an asian carp, on his long-held positions toward illegal immigration. Observe the $300 expense for airline tickets. 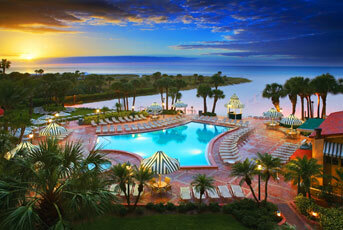 And then, a week later, there is a $540 expense for the flight's presumed destination: the Sheraton Sand Key Resort! All of which explains why your LakeCountyEye is in Clearwater Florida -- well, actually visiting the Sheraton Sand Key Resort website. Your LakeCountyEye can report that the Sheraton in Clearwater looks to be a 100% classy place to stay. And your LakeCountyEye wouldn't object to spending an actual night or two at the Sheraton Sand Key Resort, particularly if someone else was paying for it. Curran's political contributors, Friends of Mark Curran, certainly got some good bang for their buck out of this deal. But the mystery remains: Mark Curran is in Florida in August, and the trip is paid for by his PAC. What sort of political business could he have been pursuing all the way down there? They say the trick to a good mystery is in the preparation. In the meantime your LakeCountyEye can be spotted in Clearwater Florida, looking for more clues. He was preparing for his breakthrough speech at the opening night of the GOP convention, establishing beyond doubt that climate change is a myth. But then, oops, enter Hurricane Issac to upstage him! Drats!